At the start of 2019 we know that many of you will be embarking on new fitness regimes, starting new activities or increasing the frequency and intensity of your existing training habits. We see and hear the New Year, new you, at this time of year, but as we all know, getting into a new routine is often much harder than we expect. That is why so many people fall off, those New Year’s resolutions falling by the way-side, for most only a few weeks into the New Year. To stop this happening to you, we thought we would put together a quick handout to help keep you on track and get your 2019 off to a great start. In short, you need to identify the true intent and motivation behind your resolutions. If you can link your resolutions to things that you value, then you are more likely to stick to them. This on its own might not be enough, you need to link it to why going running more is important to YOU. Just by linking a resolution to what is important to you as an individual will make you much more likely to stick at it and turn this resolution into a habit. So, make sure you ask yourself WHY??? Whether that’s work, family or the other 101 things you need to do every day, these tasks often mean other activities, like our fitness habits, are difficult to stick to. That is why you need to plan. If you plan to exercise 2 hours a day, everyday of the week, unless you’re a professional athlete or don’t work, then this is going to be near impossible and a resolution you’re not going to be able to uphold. You need to pick and plan times in the week that you know you will have the opportunity to exercise. Create a diary and plan these exercise slots into your week. This will help ensure you make time for yourself and keep you on track. Be that a loved one, a colleague at work or a friend, voice your goals with someone else. There is evidence to suggest vocalising your goals to others increases exercise adherence, largely because other people will keep you accountable and will support you with your new habits. Having the support of others is shown to help people stick to healthy behaviour changes. Even better, why don’t you get a family member, friend or work colleague to join you and create new healthy habits for 2019. By sharing your experiences with others will make your fitness journey easier and less frightening and increase your chances of getting your 2019 off to a great start. Feel free to post your fitness and healthy habit goals on our Facebook Page Here. We know it’s not easy to stick to a healthy routine consistently. Hopefully these tips will help get your 2019 off to a great start and keep you on track. We are excited to announce a new package of care here at Perform Ready Clinic. We know many of you want to stay fit and healthy and keep enjoying the things you do. Injury sometimes gets in the way of that and can be frustrating when you can't do the activities, hobbies and sports you enjoy. We are also aware that generally injuries will build up over a period of time. That little niggle, that gets a bit worse, you rest a little, try to exercise again only for it to return. You might try rest again, but once you try to get back to training your pain and frustration returns!!!! Its at this point that most people then seek medical advice. Its not always the case, but the longer that symptoms persist the longer it may take to get you back to full fitness. Our Plan Of Care Packages reward commitment to helping you get back to full fitness in the way of discounted costs of both physiotherapy and massage services here at the clinic. The idea of these packages is to provide a bespoke care plan that keeps you fit and healthy ALL THE TIME. Don't wait till you break down. Keep on top of our health NOW and TAKE ACTION. Take a look at our care packages here or contact us for more details. Many people that we see in clinic report ‘sciatica’ as their issue or injury, presenting with a broad range of issues including lower back pain, buttock pain, back of thigh pain or all three! However, sciatica is NOT a diagnosis, instead it is a symptom of many pathologies and injuries that can influence the response from the sciatic nerve (major nerve that supplies the back of the leg). The REASON for the pain helps form the diagnosis and cause, a thorough assessment can help identify the REAL cause of your pain. It is important to note that there are many other causes of lower back and buttock pain absent of any sciatic nerve involvement. To determine the origin of such pains the assessment of a patient should not be limited to a 5 or 10-minute conversation or an equally quick physical assessment. Instead a broad timeline of the onset of your pain as well as the relevance of any previous injuries and movement deficiencies/errors or other contributing LIFESTYLE factors should be discussed, prior to a physical assessment of the WHOLE body. At the Perform Ready Clinic we select appropriate strategies to provide a package of treatment that we believe best facilitate and encourage the healing process - we do this following a thorough LISTENING process as you the patient are our most valuable assessment tool. We also believe that it is important that our clients are aware of the REASONS and RATIONALE for our choices around treatment and rehabilitation. We want to treat the CAUSE of pains like this, not just the SYMPTOMS. We do this by formulating a package of treatment and rehab in COLLABORATION with you, to best guide and achieve the most efficient route to recovery. With the impending holiday season right upon us most of us will at some point be traveling to spend time with family and friends. For many of us we will spend alot more time sat travelling on top of additional time spent sitting socialising at this time of year more than ever. Longer travel is likely to provide a more difficult challenge although all the concepts discussed below can be applied to travel of any length. More sedentary activities during this period could increase your chances of injury both if you intend to continue training during this period or when your training recommences following the holiday season. At Perform Ready we have put together some handy tips to help keep you fit and healthy during this period and enable you to hit the ground running with your training in 2018. Drink plenty of water before, during and after travel to help combat dehydration. This is especially important if travelling by plane as the re-cycled air circulating in the cabin will feed dehydration. The use of electrolytes can also be useful to help aid water retention and the possible loss of such electrolytes loss that is associated with dehydration. Additionally ensuring you are well hydrated prior to exercise is highly important. More so at this time of year given many of us might overindulge with both food and alcoholic drink. One of the downsides of alcohol is that it dehydrates us. Thus, if you've had a big night make sure your as hydrated as possible prior to training. If your traveling abroad this is for you. The aim of the game with travel across time zones is to align to your destination time zone as quickly as possible. Set your watch to the new time zone immediately. This will help the transition from different time zones and will enable planning of meals and sleep. Eating and sleeping should occur at the appropriate times related to the end destination to ensure a smooth transition between destinations. Time differences as small as 1-2 hours can greatly affect our sleep quality, quantity and fatigue levels. Any prolonged positioning is likely to result in reductions in movement efficiency. Prolonged sitting gives rise to tight hamstrings and hip flexors as well as increased intervertebral disc pressures. All those factors are injuries waiting to happen so get off the sofa, ipad, phone or reading your book and MOVE!!!!!! We hope these tips help you enjoy a fit and healthy festive period. From us all at the Perform Ready Clinic we hope you have a Merry Christmas and a great New Year. We’ve all noticed the change in a season the last few weeks. As the temperatures outside drop and leaves begin to fall we know that Autumn is here. It’s the favourite time of the year for some yet the earlier nights and darker mornings aren’t for everyone. As a result, the colder weather and the impending holidays result in falling off with their training. As such we thought at Perform Ready Clinic we would put together 5 tips to try keep you on the fitness wagon at this time of year. Given the temperatures are falling make sure you wear proper clothing if exercising outside. Not only will this stop you being deterred from venturing outside in the first place, it’ll make your workout more enjoyable and stop you getting ill in the process. The correct clothing and accessories (hats, gloves), the less bulky the better, will allow for warmth and make outdoor fitness more enjoyable at this time of year. As the temperatures fall your probably more likely to head to the coffee pot rather than a cold drink. But if your exercising its important to stay hydrated even when temperatures cool down. Whilst you might feel less thirsty when it's not as warm outside, staying hydrated is still so important. Keep a bottle with you during the day to try stay hydrated. Things like sweeping leaves can act as great exercise options. Try turning outdoor tasks like these into a game by setting small, achievable goals to help pass time and burn away fat. The colder weather and darker mornings and evenings can make it difficult to stay motivated with exercise. Changing your training location to include different indoor activities can be one great way to help keep exercising whilst also allowing you to build confidence with other activities you might not ordinarily do. With the impending holiday season on the horizon our schedules can fill up very quickly. I you know of upcoming events/functions try plan your training around these in advance. This might mean some weeks you don't commit to hours and hours at the gym and prioritise other activities with family and friends. Think about how much time you will realistically have and plan accordingly your training. Then hopefully you’ll get the best of both; a continuing exercise schedule whilst being able to spend time also with family and friends. If you have any further tips for staying healthy during this time of year please let us know so we can share these with our members. Hopefully these tips will help you stay healthy this Autumn. As always, any questions don’t hesitate to get in touch. We had such a great response to one of our previous blogs around sleep ‘4 Simple Strategies For A Better Nights Sleep’ we thought we’d put together another. In this blog we worked through some tips to improve both getting to sleep and staying asleep. If you missed this you can read it here. On the other side of a good night’s sleep is your morning routine. Here’s 5 tips to help you get your morning off to the best possible start. This used to be my downfall. If I woke to my alarm I often hit snooze, often more than once, only to be then chasing my tail and rushing around like a mad-man!!! However, I now actually set my alarm later than previously but get up early. So rather than my alarm going off and hitting snooze several times I now set my alarm later but am able to get straight out of bed. I do this by putting my alarm out of reach of my bed. Therefore, I have to get out of bed to turn it off. Using the above system I get more sleep, as my alarm sounds later, whilst I spend no time ‘coming round’ or ‘snoozing’. This could be something as simple as making your bed. Pick a task that will take you a maximum a few minutes. An early accomplishment puts a marker down for success that day. It doesn’t have to be any significant and could alter day to day, but the structure and plan to achieve early in the day will set you up for the day ahead. Being prepared will undoubtedly save you time and help you enjoy your morning routine more. Regardless of how long your morning routine is, from 20 mins to 2 hours, there will be a time limit on the amount of time from when you wake till the time you need to be out of the house. But what if you prepared in a way to allow for more time in the morning. For example what about prepping your breakfast the night before. It could be something as simple as getting your coffee mug out of the cupboard the night before. This might be the difference between actually having the time to sit down and enjoy your coffee rather than spending five minutes searching the kitchen looking for a mug only to remember they are all waiting to be washed in the dishwasher. Front-loading your time and preparing can allow you a buffer of time to enjoy your morning routine. As part of your morning routine try doing something. What you do will differ. It might be stretching, walking the dog or meditating. It might be doing 10 push ups. It doesn’t have to last long or be that adventurous. Similar to #2 Set An Early Win this activity gives us a sense of accomplishment and helps break up a possible mundane ‘ground-hog’ day morning routine. If for whatever reason I didn’t do the above, I make planning that day’s activities part of my morning routine. Whether that’s work, hobbies, sport, family commitments this process allows me to generate some structure to what I plan to achieve that day. If I’m also able to see what I need and want to achieve that day I can also prioritise what I need and want to do. In turn this gives me a focus and ensures I am as time efficient as possible and get to spend as much time as possible doing the things I enjoy most. PS If you missed our previous sleep related post regarding getting a better night’s sleep you can read it here. Myself and Ben were chatting the other day in clinic about anxiety generally and the affects it has on both the athletes and clients we see both in professional sport and here at the clinic. It got me thinking and as such I did some researching. I found a study which happens to be quite appropriate given the recent World Athletic Championships we’ve just seen over here in London. As a side note I tried getting some tickets for a few of the track sessions, including events involving Usain Bolt & Mo Farah, but wasn’t able to get hold of any!!!! In short, the study looked to determine predictors of injury and illness before the previous World Athletic Championships (Beijing, 2015). A total of 307 athletes completed a health screen, whilst all new injuries and illnesses that occurred at the championships were recorded. Of the 307, 116 athletes (38.3%) reported an injury symptom during the month before the championships, while 40 athletes (13%) reported an illness symptom. Various different findings were evident including endurance athletes being 10-fold more likely to sustain an in-championship illness than speed/power athletes. That said the biggest standout for me regarding this research paper was the link between increased injury risk and anxiety. Those athletes reporting an illness symptom causing anxiety were five-fold more likely to sustain an in-championship injury. For me this is obvious. Injury of any type is the result of our bodies being unable to tolerate stress. When we reach failure point any tissue, be it bone, ligament, muscle, fascia etc, will break. This could manifest itself in a muscle tear, tendonopathy, bone fracture, ligament tear etc etc. What we often don’t consider is other stressors, non-physical stressors that contribute towards an our overall ‘stress’ level. Ultimately the more we are ‘stressed’ via physical and non-physical stressors, the more likely we are to break down. Obviously, recovery strategies or for a better term ‘de-stressing activities’ play a big part in this process. In short, if we progressively load, we adapt, assuming adequate recovery is observed. But, how often have you really observed and acknowledged the non-physical stressors that may have contributed towards one of your past or current injuries? In most environments, this happens very infrequently if ever!!! Some of these non-physical stressors could be financial, work related or even issues with family or friends. Can you remember the last time your lower back, knee, shoulder hurt? Did it come on for no reason? Have a think what else was going on at that time. Were some of these other stressors active (heavy work schedule, relationship or finanical worries etc)? If so its likely that these were strong contributors to why your injury started or resurfaced. Rather than a reactive system, wouldn’t we be better at trying to screen and observe these stressors frequently, to pick up any possible issues that might predispose injury, to try prevent injury before it happens? A more proactive approach seems reasonable rather than reacting to injuries after they have occurred. By failing to look out for stressors, not just the physical stressors, we are missing a big trick!!! Article Reference: Timpka et al (2017) Preparticipation predictors for championship injury and illness: cohort study at the Beijing 2015 International Association of Athletics Federations World Championships. British Journal of Sports Medicine, 51 (4), 271-276. For many a particular activity and pain go hand in hand. Like a trip to the dentist always brings about those feelings of anxiety and fear associated with the impending intervention. And whilst you are just booked in for a routine appointment you still have the same level of apprehension as the last time you saw the dentist when he pulled several teeth out. Why do these feelings return even though you know that it’s just a routine check-up? 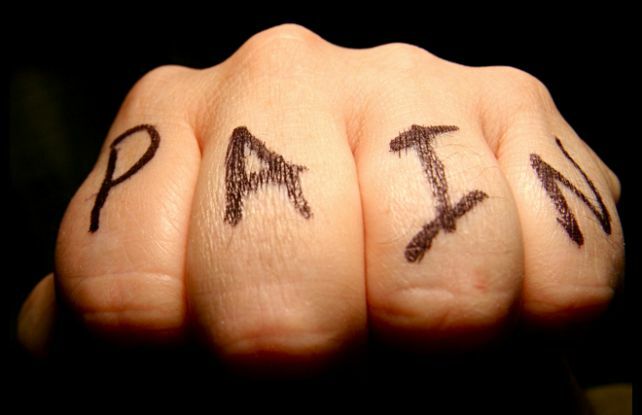 If you looked at the dictionary definition of pain it reads like this…..
Labelling pain is difficult. How you or me might rate the same pain would most probably differ. In the world of medicine, we often use pain scales to allow those we work with in pain to score their current symptoms. Whilst these might be useful to help clinicians provide a baseline and gauge patient progression through treatment and rehabilitation interventions trying to classify pain is a minefield. Pain isn’t something that is easily labelled. Pain is exclusively subjective and as previously stated will differ widely from patient to patient. Therefore, trying to pigeon hole someone symptoms to a scale is very difficult. Pain is an experience and pain is a perception. This experience might be the result of actual tissue injury (e.g. result of inflammatory process which excites pain receptors) or could be the perception of potential symptoms (e.g. fear of potential injury/pain). 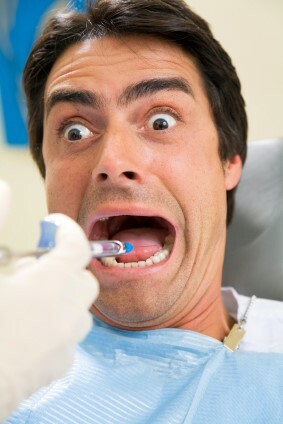 Going back to the dentist example, this could explain why some of us fear certain experiences. Regardless of the impending intervention a trip for the dentist for some will always be an unpleasant experience as they perceive potential harm. But why? Central to perceived pain in both the present and future relates back to our past experiences. This provides an explanation as to why certain experiences continue to be unpleasant, like that trip to the dentist. In a study by a group German researchers (1) they found how preconceived notions of pain specifically affected a patient´s experience of pain. 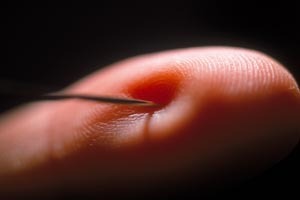 They found that past experiences with needle pricks, combined with information received before having an injection, greatly influenced each individual’s pain experience. In the experiment, participants watched various video clips whilst receiving painful or painless electrical stimuli to their hand. The video clips included shots of a needle pricking a hand, a Q-tip touching a hand, and a hand standing alone. The screen showing these clips was placed above the participants own hand; therefore, giving the participants the experience that the video image was their own hand. During the experiment the participant’s felt varying degrees of pain. This isn’t surprising given we perceive and rate pain individually. What was interesting however that was the clips showing needles pricking the hand, elicited pain levels far more intense and unpleasant than the Q-tip touching the hand and the hand standing alone. These individuals are relating back to previous experiences. The brain will remember the last time the body received a needle prick and the associated negative thoughts and emotions that accompanied it. The increased pain scores observed in the study also matched to increases in autonomic nervous system activity. Those perceiving more pain (those exposed to the needle images) showed increased pupil dilation responses, indicating heightened nervous system activity, the body’s fight or flight response. The study also found that the participant’s expectations affected each participant’s pain response. Before the experiment started, the participants were told that either the needles or the Q-tips were more related to painful electrical stimulation than non-painful electric stimulation. As a result, the images shown to participant’s that highlighted pain (i.e. images related to needles), proved to produce higher levels of self-reported pain than clips less associated with pain. This proves that the participant’s expectations or perception of a particular painful experience directly influences the intensity of the pain participants felt during the trial. So it would seem clear that past experiences influence perception which plays an important role in pain provocation. Basic pain science tells us that pain is the brain’s way of telling us something is wrong. Pain can be the direct outcome of tissue damage, if you cut your finger, it hurts. However, pain is not always a good indicator of tissue damage. Pain can be the result of the brain telling us we are under threat when the brain perceives possible tissue damage. The brain may perceive a threat even when there is none. In the same way it may ignore a threat even when the threat is very real. Think of the stories you may have heard about an injured soldier in battle, who is able to keep fighting despite catastrophic injuries and at that time felt no pain. Or the sport star that discovers he has broken his ankle long after the game has finished, having played the majority of the game with this injury. In both these situations, there is clearly tissue damage, but how the brain perceives, or doesn’t perceive pain results in no pain being felt at that particular time point. Past pain experiences, anxiety and emotion, which may run independently from the diagnosis, will all influence our perception of pain. There is no straightforward relationship between tissue damage and pain. Therefore, trying to classify pain and trying to control pain given the complexities of its origin (tissue damage and/or perception) is very difficult. Does the brain get it wrong? I believe it doesn’t. But is in fact doing something very clever, using all the information it receives to make a decision on how to protect (pain) or not protect (no pain) the system at that particular time point. 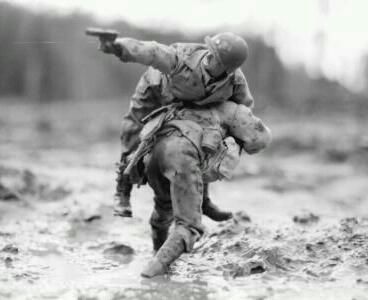 In the case of the soldier above the brain is able to override pain coming from his catastrophic injuries to allow him to continue to fight, as it might be a matter of life or death. Those individuals that have persistent or chronic pain are inevitably going to have altered pain control mechanisms via both the central and peripheral nervous systems. With chronic pain the nervous system becomes increasingly sensitised. This means the relationship between pain and actual tissue injury becomes weaker and also less predictable. It could be said for these individual’s pain is not actually a symptom of another disorder; pain is the disorder. This definitely doesn’t mean that the pain isn’t real. We need to remember that all pain is created by the brain. Pain equally is not weakness leaving the body as many lead us to believe. Pain production is part of the body’s highly complex protective mechanism. The body craves homestatsis. The brain uses every piece of information at its disposal to keep us functioning as close to neutral as possible. Pain is a way of telling us something is wrong, but pain messages can be dampened depending upon the needs of the body at that particular time point. The brain and pain science is a highly complex relationship still in its infancy. The more knowledge we attain about this relationship the more we will be able to learn about pain provocation and pain management. Until then we need to make efforts to acknowledge pain, both actual tissue damage and perceptions of actual or potential tissue damage. Failure to do so will likely make our interventions less effective and for many lead to the continued presence of daily pain and increased apprehension of certain future activities. Pain is just an output the brain. This doesn’t mean that it originates in the brain. Past experiences and our individual perceptions of pain contribute to what we feel. So just remember, pain is NOT in your head. 1 Pain study: Viewing a needle pricking a hand that you perceive as yours enhances unpleasantness of pain,” by M. Höfle, M. Hauck, A.K. Engel, and D. Senkowski in PAIN, Volume 153, Issue 5 (May 2012). Our body’s internal clock is located within the brain and the onset of sleep is influenced, in the main, by hormones (cortisol, melatonin & serotonin), light and nutrition. With those things in mind, modern day life provides factors for us all that means we are not lead by our internal clock but instead the societal 9-5 clock. Other influences such as artificial light from phones, TV etc. can all influence our ability to gain quality sleep – even if you drift off on the sofa often the bathroom is the last room you go in before bed and it has the brightest light! As we spend 36% of our lives is spent asleep, improving the quality of such sleep is obviously important. Muscle soreness, adrenaline, caffeine, thoughts or general worries can increase stress hormone levels and conflict with you ‘trying’ to get to sleep. Instead of trying to battle your way to sleep try to make relaxation your goal. Implementing techniques like self-meditation can help to de-stress the mind. This does not necessarily have to be a stereotypical form of meditation like making humming noises and listening to dolphin music (although this can work great), reading a book can be equally as good. If you cannot sleep do not try. Bright lights cue your body to wake up, this includes using your mobile phone in a dark room – although some have an extra dim setting, its best to try to avoid using your mobile in your bedroom all together. •	The bathroom is often the brightest room in the house and the last room you usually attend before bed. Brushing your teeth after the last meal of the day can help to limit this exposure so close to sleeping. If your body’s thermoregulatory demands are high at night due to an overly warm environment then this adds load or ‘stress’ to the central nervous system that is trying to rest and recover. •	Cold baths or showers for 5-10 minutes can help to get a head start to reducing thermoregulatory load. Performing meditation or breathing techniques in a cold bath or showers are also great to get your body in a more relaxed state. There are a million and one suggestions about vitamins and supplements but some of them are hot air with no real proof that they work. Less complex carbohydrates (white breads, rice, cereals, potatoes and pastas) aren't the devil, especially straight after exercise. Eating these types of carbohydrates instead of lower GI foods (sweet potatoes, wholegrain versions) approx. 4 hrs before bedtime raises the production of a hormone that controls when you sleep then wake up, which would help you get to sleep if this is something you struggle with. Magnesium has been shown to decrease levels of stress hormones significantly. It also works as muscle relaxant. Magnesium is found in nuts, cheeses and red meat. We hope these strategies will help you get a good nights sleep. Have a go at implementing some of the tips above and let us know how you get on. Static foot postural assessments give us information about the static foot, but beyond that I don’t believe such assessments give a good indicator as to what happens during gait. Therefore, using both static and dynamic assessments that involve movement with someone with a suspected ankle and/or foot driven problem is necessary. Relying solely on static information is all well and good but probably won’t reflect the changes and movements that occur to both the foot and ankle when moving. That is not to say foot postural assessments are worthless. Completely the opposite, just that we need to extract the correct information from the assessment that will help improve that person’s problem. For example, an athlete might present with an ‘over pronated right foot’ in a static standing position. If just this information was used, this athlete might be fitted with an orthotic to prevent over pronation. This might fix the over pronation but could cause a magnitude of other issues. The orthotic, causing a blocking into pronation, will reduce the necessary stretch of the ankle and foot supinator’s thus reducing their ability to propel the body forwards supination of the foot. In essence, the orthotic acts as a block to the stretch shortening cycle necessary for optimal foot and ankle mechanics. We know that a reduction in stretching length during the stretch shortening cycle will limit the ability of the tissue to generate force during the shortening phase. That means for the system to produce the same amount of force, additional work will have to occur elsewhere in the system. A lack of supinatory force might mean the knee, hip and/or pelvis musculature have to pick up the slack and could cause overuse issues within these areas. These issues will be magnified within the athletic community, once we add more function into the system i.e. running, cutting, jumping etc. I am not against orthotics in any way although I do believe sometimes they are incorrectly prescribed without function and movement in mind, particularly so in athletic populations. Part of the reason stems from how the foot and the foot arches in particular are viewed. One foot bigger than the other? It is a well-known ‘fact’ that one foot is bigger than the other. 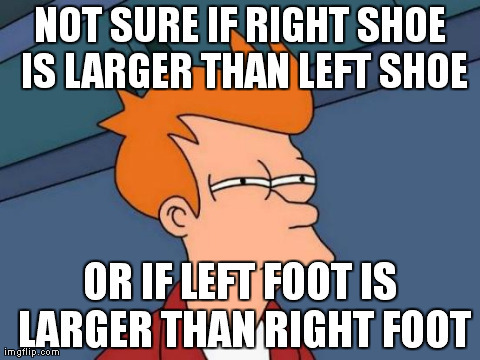 Whilst this might ring true for some, for the majority it is the difference in foot position that is giving the appearance of a foot length discrepancy. Take for example someone that is oriented into their left hip i.e. weight is distributed more over their left side than their right side. This would be reflected with a relative position of the feet like that shown in the image below. With weight shifted left, the left foot is in a relatively supinated position whilst the right foot is in relative pronation. 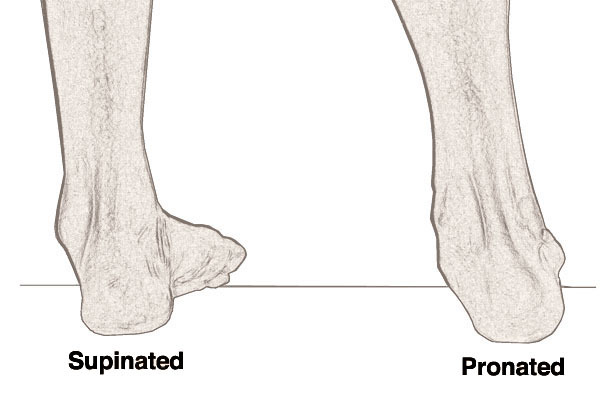 A supinated foot, largely due to lifting of the medial arch, could appear shorter in such a standing position, whilst the pronated foot, with a more lengthened medial arch relative to the other side would appear longer. Therefore, foot position may be driving a foot length discrepancy and as a result such a discrepancy in foot length might be positional and not structural. By not considering the above it could be seen that someone presenting with a flat flexible foot and another with a flat rigid foot, both ‘over pronation’ patterns might be deemed the same and hence treated the same. But giving a flat rigid foot an orthotic to limit movement is only likely to feed the pattern and as such make a rigid foot more rigid. We want the foot during pronation to adopt its mobile adapter function so why would be block that with an orthotic? In summary, static foot assessments give what they say on the tin, static foot assessment. They don’t consider what the foot needs to do or indeed what it actually does during gait. Thus, any static assessment should be part of an assessment that also involves dynamic foot movement to ensure both the static and dynamic functions of the foot are addressed correctly. 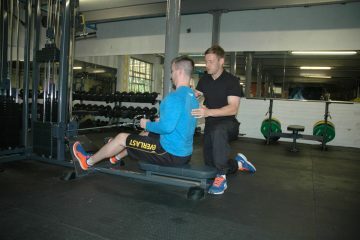 At Perform Ready Clinic we look at the body as a whole to help you get you back to full health. If foot assessment is applicable this can be included as part of your assessment and subsequent treatment and rehabilitation package. Here are 5 common misconceptions – hopefully you will find them interesting! Preacher, z-bar, standing, seated… There are many ways to skin a cat, but which is the best way? As soon as you walk into any public gym there is a 99.9% chance that someone is doing some form of a bicep curl (especially when holiday season comes around) and why not? Electromyography is a ‘tool’ medical and sports science professionals use to assess the electrical activity in a muscle – simply put the more activity, the more muscle fibres used. So which curl is the best? The dumbbell preacher curl is often the ‘go to’ exercise for many gym goers, however this type of curl causes high bicep activity in a limited range of movement. Winner: Incline seated dumbbell curl and standing dumbbell curl demand the highest bicep activity throughout a whole rep. This should be your go to ‘gun show’ exercise. Focusing on restricting the amount your shins travel over your toes, by increasing the forward bend at your torso does reduce knee joint forces, however there is very little proof that these forces actually cause injury (much higher forces at the knees are created when we run!). What has been proven is that there are considerably greater compressive forces through your lower back with this increased forward lean which can lead to injury if we do not lift correctly. Following on nicely from #2…There is a belief that the back squat demands more ‘work’ from the glutes and hamstrings than the front squat. On the flip side there is a common belief within the gym community that the front squat is predominantly a quad focused exercise… Whilst there is some truth to the back squat being the more glute and hamstring dominant exercise of the two, the muscle demands are not actually that different. Front and back squats both require high efforts from all these muscle groups. In actual fact it is the angle of the knees and hips at different stages of the squat that dictates which is the main muscle responsible for producing the movement – as the exercises are very similar this ‘sequencing’ isn’t really that different at all…We would go as far to say that the front squat would be our lift of choice within a program (unless you are a competitive lifter), as it been shown to cause similar gains in strength to the back squat but causes significantly less forces through the lower back than the traditional back squat. As much as we might not want to believe it, we as therapists do not heal people. I have been giving this concept more thought following a patient treated in the clinic earlier this month for chronic lower back pain. Through both manual therapy and rehab we were able to eliminate his symptoms of 20 years in two sessions. Given the severity and longevity of his symptoms, the patient was unsurprisingly very pleased and stated ‘You’ve healed me!’ I hadn’t, far from it really, we had just given the brain and the body an opportunity to correct itself through the means of the manual therapy techniques I had used and the patients rehab exercises. Whatever systems of treatment or rehab used by therapists, the key is to give the body and brain ‘opportunity.’ It’s all about getting changes to stick, not just about eliciting change quickly. We all know the brain is KING. It pretty much controls and drives everything we do, from sleep to hunger, to emotions to movement. Relating to injury and pain, we know control of movement is highly important. Relating back to the example above, the patients lower back pain was traced back to a minor ankle injury 5 years previous to the start of his back pain. The brain had found a way to work around or ‘compensate’ for the initial ankle injury, changing what was happening at other joints in the body. In this case causing altered mechanics at the lower back. Could the lower back pain have been eliminated without looking at the ankle? Maybe so, but would that back pain have stayed away without treating the ankle? Likely not. We don’t heal. We just give patient the tools to heal themselves and facilitate that process. The biggest and most powerful tool we have is the brain so we would be silly to omit it from our interventions. Hamstring symptoms, tightness and/or pain are a common occurrence within the active population amounting to a large loss of time from athletic activity. Many of these symptoms seem to reoccur despite good treatment and rehabilitation strategies. Question is: Why do these symptoms reoccur? The answer is finding out what is causing the problem in the first place. By only treating and rehabilitating the presenting symptoms i.e. the hamstring, you are doing nothing to decrease the likelihood of further injury. We know the biggest precursor for injury is previous injury so the likelihood of reoccurring injury is more prevalent, which makes finding and fixing the cause of the symptoms the best way to manage an injury. Probably the most common reason the hamstring break down is the fact that they are protecting some other issue. For example, they may be working hard to stabilise an issue in the lower back. In such cases the hamstrings will continuously stay 'ON' and struggle to switch off or relax. You can stretch them till the cows come home, but if they are protecting something else, they will never relax. Why would your body let them relax, if they are protecting you from further injury? Finding the cause of the symptoms, not just treating the site of symptoms is the only way to ensure re-injury does not occur. In Part 1 of this blog we looked at hamstring injury, an issue that affects many within the active population. Despite good treatment and rehabilitation strategies hamstring injuries often re-occur. The main reason for this relates to the fact that often the region which someone experiences symptoms i.e. the hamstrings, is not the cause of these symptoms. Part 1 explored some of the reasons people get hamstring problems, making us identify and consider the cause and not just the site of symptoms. If you missed it click here to view it. Part 2 relates some of the ideas discussed previously to a common activity – the squat. Probably one of the best exercises to do in the gym, however, this activity more than any other gets butchered in the gym. Take a look at our tips as to why your squat might not be up to scratch. 1# Can you attain and maintain a good pelvic position? The hip flexors (rectus femoris/illiopsoas; muscles at the front of the thigh) as there name suggests flex the hip, but also act as antagonists (work oppossite to) the hip extensors. Depending on how short or tight they are when they are relaxed ultimately affects the position of the pelvis due to their anatomical attachment sites (e.g.. the rectus femoris attaches at the front of the pelvis). To relate this theory to specific muscles, if there is not an optimal balance between the the muscles that attach to the front and back of the pelvis then this will affect both the resting and active position of the pelvis. This muscle imbalance will cause the body to adopt an altered position at rest. In addition, such an imbalance will result in suboptimal patterns once we start to move, for example like during a squat. Fixing up this imbalance is not a easy as strengthening the weaker muscle group. Because of the altered pelvis position unless pelvis position is considered and corrected alongside muscle strengthening then problems will continue to exist. Anterior tilt describes the position of the pelvis when it is tilted forward, when we adopt this position we often also present with a number of other postural changes such as an extended lower lumbar spine, short hip flexors and as a result long and mechanically inefficient hamstrings. This is a common position adopted by many of the clients we see. It can be seen in the image below, note the heaviliy arched lower back. The way the joints in the lower back are aligned means that in this position the joint surfaces are approximated very closely. In this position (upright standing) it is unlikely to cause a great degree of issues. However, when you introduce movement problems can start to arise. Adding load i.e. weight via a squat, will cause tremendous force through these joints. Repeated bouts will commonly result in injury to the lower back, resulting in pain, restricted movement and reduction in function. Looking more closely at the squat, if you adopt an anterior pelvic position similar to the image shown above, when you start to descend into the squat your lower back muscles (vertebral paraspinals) will work over time to provide stability to make up for the inefficient contractibility of the anterior ‘core’. The core is unable to produce optimal force due to its lengthened position, secondary to the position of the pelvis. This position of extension and anterior rotation is associated with a wide range of pathologies that can become a greater issue if you perform repetitions of exercises such as the squat, particularly at higher speeds or loads. At Perform Ready Clinic we are of the belief that the position that you adopt before you move will have a massive influence on how you perform that given movement in terms of lumbo-pelvic stability, weight transfer and muscle recruitment. Relating to the squat, the inability to achieve a good starting squat position doesnt bode well once movement and load are added. If the position of your pelvis and lower back looks something like the above image you should not be adding load to this. In short, you need to be able to achieve a better position of both pelvic and lower back position and have the ability to control this position during movement. The inability to do some will undoubtfully result in injury. This doesnt mean that you wont be able to squat, your body likely just needs re-educating and retraining in the squat movement. Your suboptimal squat pattern might be the result of several factors; mobility, stability, movement programming issues. The cause of the suboptimal pattern must be firstly identified then treated if improvements in the squat are to be made. Continuing to squat poorly will result in the body compensating and making other structures e.g. lower back and the hamstrings do too much and increase their risk of injury. If you think any of these issues relate to you and you could benefit from an assessment by one of our clinicians please contact us for more details. Click here for more details. Sport massage: Why all the hype? Sport massage has quickly become one of the leading therapies utilized by modern athletes with professional sports teams actively seeking out skilled sport therapists. Sport massage found its initial media spotlight in the 1980’s when athletes accredited their success to routine soft tissue maintenance and deep friction massage. This faith and adherence to sport massage actually dates back to the great coliseums of the Greek and Roman empire where the gladiators were prescribed massage before and after exercise. So what exactly is sports massage? Sport massage is a form of deep bodywork, it is a combination of tailored Swedish massage and Deep tissue techniques aimed at those effected by intense physical exertion on the body. Sport massage has differing approaches depending on if it is part of an injury rehabilitation program or whether it is being applied as pre or post event treatment. The primary purpose during a routine rehabilitation program is to reduce pain and stiffness in both muscle and joints, this treatment also improves range of motion in these areas. Pre/post-event massage focuses on warming muscle and connective tissue to help prevent injury during exercise. It then aims to speed up recovery by removing toxins and lactic acid after a workout. Decreasing pain and stiffness as well as the removal of unwanted toxins reduces the recovery time between training and events, ultimately allowing for a quicker return to training and faster results. How often do I need to have Sport massage and for how long for? This depends on what your aims are, or how demanding your current training is on your body. For a healthy individual that is looking to reduce the risk of injury, a massage every 4-6 weeks is a great addition. However, if you are suffering from muscle pain or tightness, then a massage every 1-2 weeks is highly recommended. The lighter, pre/post-event massage would be performed no later than 24 hours before or after said event. As sport massage uses various deep techniques, adequate time is needed to warm up each muscle group before carrying out the firmer methods. Therefore, 1 hour is often needed if more than one muscle group requires work e.g. quads, hamstrings and calves, however, 30 minutes can be sufficient if only a ‘top up’ is required on a specific area e.g. lower back. To conclude, regular sport massages have been seen to benefit an athlete’s strength, speed, endurance and flexibility. By keeping muscle quality at its optimum level an individual’s athletic performance is enhanced while simultaneously lowering their risk of injury. Your time is valuable so make sure you think about your own personal recovery plan. Further blogposts delving deeper into the specific techniques of sport massage such as trigger point therapy and myofascial release coming soon! If you would like to learn more about the benefits of sport massage and whether it is suitable for yourself, then please contact us directly where we can arrange a consultation with one of our therapists. Post by Josh Stevenson, Soft Tissue Specialist at Perform Ready Clinic. Hamstring symptoms, tightness and/or pain are a common occurrence within the active population amounting to a large loss of time from activity. Many of these symptoms seem to reoccur despite good treatment and rehabilitation strategies. Often the region which someone experiences symptoms is not the structure that needs the most focus to eliminate symptoms and increase function. In part 1 of this blog we will explore some of the reasons people get ‘tight’ hamstrings. In part 2 we will relate some of the theory to a common activity – the squat. One reason the hamstrings may present as 'tight' and continually tighten is that they are being overworked. By this we are not referring to excess training volume as a cause of injury but local muscle tissue overload i.e. hamstrings have to take up the slack of other muscle groups to perform certain movements. For example, someone that cannot utilise their gluteal muscles, may really heavy on hamstring muscle force generation to perform movements involving hip extension i.e. squat, lunge, jump, running patterns. Over a period of time, the hamstrings may reach their limit of tolerance and at that point injury will occur. This largely relates to the position the hamstrings sit as a result of pelvic position. We know that a muscle works best in its mid-range position i.e. when the muscles are neither too short or too long. If a muscle is too short or indeed too long then it is unlikely to operate optimally. The position of the pelvis will ultimately set the resting position for the hamstrings due to their attachment site on the pelvis (ischial tuberosity). With many athletic individuals we see a tendency for lengthened hamstrings at rest due to an anteriorly rotated pelvis. This is especially so in those individuals involved in running based sports and hobbies. These individuals generally look like this. Notice the excessive arch in the lower back (lumbar spine). This position is also highly likely to lead to lower back pain alongside the heightened risk of hamstring injury previously mentioned. The problem with this is that the hamstrings are positioned long relative to the distance between the attachments at the pelvis and below the knee, hence they will not be working optimally due to the lengthened position. Unless pelvic position is improved and moved towards ‘neutral’ the hamstrings will never be able to work optimally. Simply put, the hamstrings are doing their job and the job of other structures. A great example to use for this might be someone that is lacking stability around the pelvis. As a result the hamstrings, built as prime movers not stabilisers, might be asked to provide stability to the pelvis. Ultimately this gives the hamstrings more work to do and as result injury is more likely to occur. The hamstrings are not made as stabilisers so we don't want them used to stabilise. Unless pelvis stability improvement in such an individual is improved the hamstrings will continue to do too much and increased risk of injury is likely. We hope this post provides an insight into some of the reasons more conventional hamstring rehab plans fail to prevent reoccurrence and provide substance that it is always important to not only diagnose an injury, but also determine what caused the injury. Think twice about stretching those 'tight' hamstrings! Look out for Part 2 of this blog coming soon. If you require any further information about the content of this article and/or the services offered by Perform Ready Clinic please contact us.